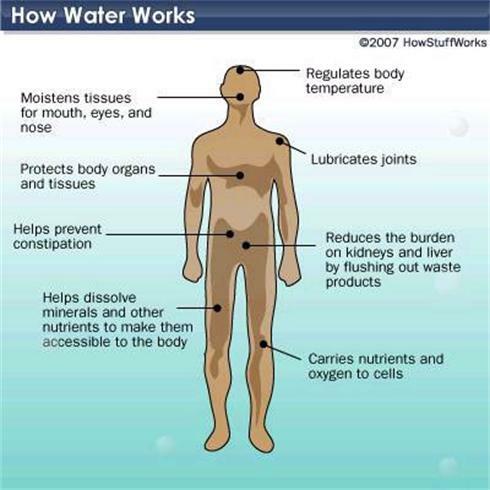 The benefits of drinking water are well documented and we know we should be drinking more! Your brain is 85% water! Imagine a piece of natural sponge you have in your bathroom and the difference in its weight when it’s dry and when it’s saturated with water…mmm! A dehydrated brain leads to headaches, lack of concentration and generally feeling tired. It has been proved that children who drink water throughout the school day, achieves better results due to higher levels of concentration. Your body is 75% water! Running your body dehydrated is the equivalent of running your car with water tank empty. If its not getting enough water, your body will react by pulling it from other areas which includes your spinal area (hence sore backs), your brain (hence headaches), your skin (premature ageing) and your blood (causes capillaries to close down, thickening and slowing blood flow). Your skin is 80% water! Studies have proved that there is a direct relation to the elasticity and thickness of the skin to the amount of water we drink. When dehydrated, water is absorbed from the skin leaving it dry and thin. The water content is partially restored one hour after rehydration however, loss of skin elasticity is also associated with ageing and so dehydrated skin may appear to be older than it actually is. 60% of us are dehydrated. Medical and scientific advice tells us that to keep our body and brain fully hydrated; we should be drinking at least 2 litres of water throughout each day. Installing a Fionnar Water Coolers provides a convenient and delicious, crisp cold, way to keep your hydration levels healthy – give us a call today to arrange installation.